Day in and day out, this Riviera Beach location may well be the best shore dive in Florida. It has two distinct sites, tons of small critters for the macro person, enough big fish to keep you looking around, and best of all, it's free, dawn until 10 p.m. Click for Photos of critters commonly found here. Dive on high slack tide. Like all areas in the lagoon system, to get clean water and low current, it should be dived near high slack tide. This means to schedule it, you have to avail yourself to NOAA tide tables linked here, or use the handy tide menu on the left. Be at the water's edge ready to enter 20 minutes before high tide. I-95 to Blue Heron Blvd. This is exit 75, near mile marker 75, north of West Palm Beach. Turn east until you see the bridge, and cross over it. Before you reach the other side, the entrance to Phil Foster Park will come up on the left, at a traffic light. Use the map below to orient after that. Phil Foster Park is north of the bridge. For the west site, park at 1, enter at 2. For east or both sites, park at 3, enter at 4. Arrive early and scout both sites on foot. and the boat channel south of the park. Bring a small light to look into crevices. 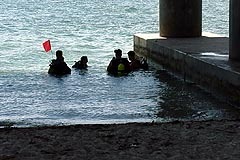 You must display a dive flag at all times. Be at water's edge 30 minutes before high tide, geared up and ready to go. If doing both sites, do the east first. Its tide window is shorter. Fishermen are overhead at both sites. Avoid lines by staying under the bridge(s). Read "About tides" below and pay close attention to the current, particularly on the east site. When current gets bothersome, head for the exit, as normal egress may soon become impossible. There will be many diver groups on weekends. 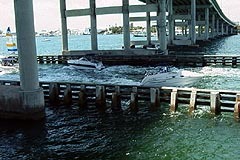 Docks are private property, and dangerous. Their electrical wiring may cause injury or death, boat traffic risk is great, and the dock owners will get mad. Keep Away! a narrower time window to do the dive. Conversely, the closer to 2 a.m. or 2 p.m. (EST) the high tide is, the lower it will be. You can expect low current and longer dive windows, but also lower visibility. Heavy rainwater runoff from the state's interior will produce a green water effect. Wind driven surge on the ocean will silt the incoming tide, producing a white effect. Diving the low slack tide will have markedly lower visibility than the high tide. Since most of the critters will be seen closeup, lowered visibility usually only affects orientation, and diver state of mind. You MUST stay oriented, or else you'll wander out into the boat channel with potentially disasterous results. Generally, most days of the year the high tide will provide an acceptable dive if you take your time and don't contribute to lowering the visibility yourself. At times the water is ice blue, and the bridge pilings are easy see from far away. By paying attention to rainfall and offshore storms, you can avoid problem days or nights in advance. Do NOT wander into the boat channel under the main bridge. This is deadly, as the channel is only 12 feet deep. It is particularly easy to do this at night if you are not careful. The old and the new Blue Heron bridges. Two distinct dive locations, east and west. Should be dived near slack high tide. Lots of macro life, and some big fish too. Max depths = 23 east site, 19 west site. Available dawn until 10 p.m. Both sites can be done in one trip. To see all the different species, you need to take your time and do both sites more than once. For normal swimming and observing, the east site takes about 20 minutes and the west takes around 40. Sightings of the rarer fish, like batfish and flying gurnards are about equal at both sites. If you can only do one, it should be the west site, as it has more areas to explore. You can also leave the east site after 20 minutes, walk fins in hand to the west site, and do both on one trip. Read the sidebars below for details. Ingress point for the east site. Enter from the beach at the SW corner of the bridge. Make for the nearest pilings, hugging the shallow areas if the fishermen are fishing on the south side of the bridge. Explore each group of pilings up and down. Each piling structure has some rubble at the base, inhabited by scores of arrow crabs, banded coral shrimp, lobsters smaller than you've ever seen, and lots of juvenile fish. The upper water column near the pilings has schools of spadefish, scrawled filefish, several wandering gray angelfish, and occasionally a barracuda. As you go around the pilings on the north edge, look into the rocks and bottles for small blennies and gobies. Look for batfish, as well as other bottom dwellers, in the open space under the bridge. After exploring beneath the bridge, turn south as far as the first dock and then explore the sandy area westward back to the beach where you entered. Note that this is a live fire zone if there are a lot of fishermen, as they tend to cast out there on an outgoing tide. This area has a lot of pillow starfish in a variety of colors, and is also where I've seen the flying gurnards. Do not go under the docks, as they are private, and dangerous, both from boat and electricity standpoints. Ingress point for the west site. The basic plan is to explore beneath the fishing pier on the way out, then explore the pilings of the big bridge on the return. Enter the water at the footer of the new bridge (shown above and on the map), near the sailboat ramp. 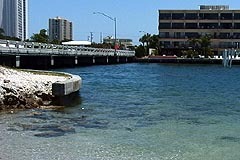 Swim around the footer and head to the north side of the fishing pier. Explore all the deeper pilings (the last 7), the rubble below the pilings, and in particular, the extensive rubble field under the north edge of the fishing pier. There are always arrow crabs, banded shrimp, juvenile top hats, usually a spotted moray or two, and lots of scorpion fish. Beware where you put a hand! 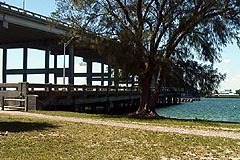 Explore the complete area, including the open spaces under the bridge between pilings. Be sure to locate the last set of pilings on the fishing pier, as they mark the dive turning point. There are double the normal count, with a buttressed set reinforcing the main set. Turn south, explore the weedy terrain south until you locate the big pilings of the main bridge, then turn back east and explore them. You'll find a lot of fish in the upper water column, and snake eels, big puffers (baloonfish) and lots of sand dwellers at their base. We see the flying gurnards in this area also. This site is also a particularly good night dive. One night dive my buddy and I found 5 octopi hunting along the rubble fields of the pier. Some were reclusive when our lights showed up, but others just hunted away as cameras blazed. That's also when the gigantic puffers are easiest to video.